The Velveteen Rabbit (Or How Toys Become Real). The Velveteen Rabbit or How Toys Become Real. 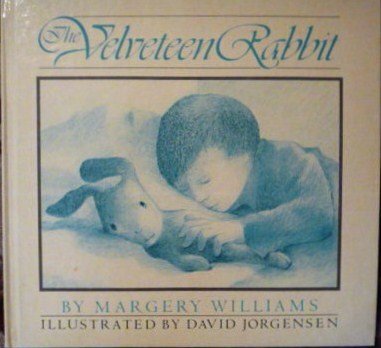 The Velveteen Rabbit, Or, How Toys Become Real. The information listed for this specific book and the picture shown do NOT match. The image clearly shows a different illustrator than listed in the information. I do believe the barcode listed does match the image. However this is not the version illustrated by Robert Blake and abridged by Karen Aspy in 1985. The correct information is: The Velveteen Rabbit By Margery Williams Abridged for young readers by Karen Aspy Illustrated by Robert Blake Published by Ideals Publishing Corporation by 1985 Joshua Morris, Inc. Nashville ISBN: 077031813084 Note: The information I have provided is a board book that comes with a small stuffed velveteen rabbit inserted into the front of the book. The correct image can be found on Worldcat.org and Robert Blake's website. I own this specific book and all information listed is directly from it. 7/18/2013 Jeanne Prevost said: This is one of my all-time, very favorite stories. I get goosebumps every time I read it. 1/21/2011 Theresa Smythe said: Simply one of the best. 10/22/2009 Emily Grandin said: Some stories leave scars... this story and its images marked me in childhood, and continue influence me to this day. 3/28/2009 Laurie Mayhew said: I love this version. I find the soft illustrations add a lovely dreamy quality to the story. We own three versions and this is our favorite. 2/4/2008 Marie Boyum said: My favorite children's book! There is so much to the story that anyone of any age can learn from. A classic tale that should be in every home. 1/6/2008 Felicity Hansen said: Love makes you real, even though it may also make you a little shabby in the process. This is the essence of this wonderful story of what it means to be real. A story to restore one's faith in life, and hope in fuller life to come.